Hot flashes during perimenopause are not only physically uncomfortable, but they can also evoke anxious feelings and disrupt a woman's life. Luckily, there are ways to fight back. 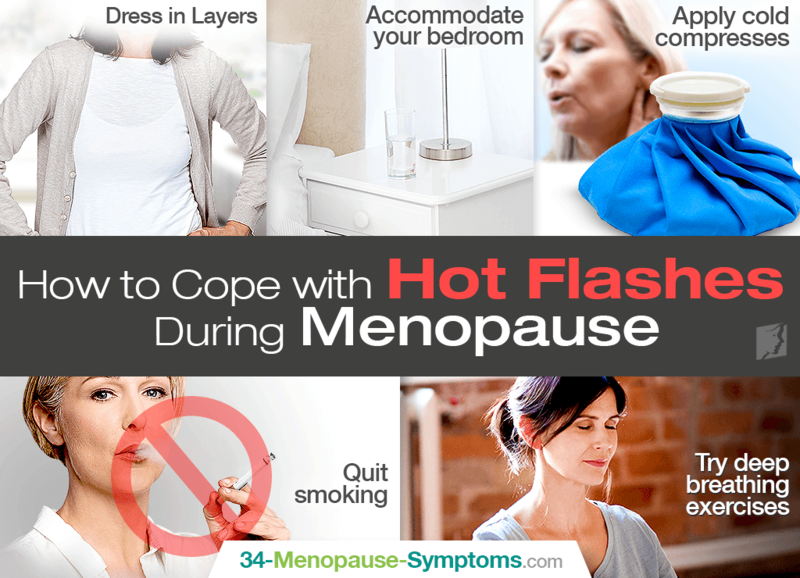 Continue reading to learn how to cope with hot flashes during perimenopause so that you can come out of this transition feeling cool and relieved. Dress in layers of garments made of breathable fabrics, like cotton. Removing or adding layers at will can help you control your body temperature and cope with hot flashes. Keeping your bedroom air conditioned with a glass of cold water next to your bed overnight will help you manage any hot flashes that may occur during nighttime hours, also known as night sweats. An ice-cold washcloth or cold compress draped around your neck can cool you off in an instant when suffering from a menopausal hot flash. Smoking deregulates cardiovascular functions, thus increasing the likelihood of triggering a hot flash during menopause. Also, scientific studies have found a positive correlation between smoking and hot flashes. At the onset of hot flashes, practice at least 15 minutes of deep breathing techniques. Also do so in the morning and evening. Take between six to eight breaths per minute, concentrated in the abdominals. But, Why Am I Suffering From Them? The primary cause of hot flashes during perimenopause is changes in estrogen levels. This hormonal imbalance can affect the hypothalamus, your body's internal thermostat, and cause your body to sweat to cool down unnecessarily. This results in the sensations of intense heat and visible redness during a hot flash. Moreover, certain triggers can offset an episode. The most common are stress, spicy foods, strenuous exercise, excessive coffee or alcohol consumption, and smoking. Avoiding this triggers as much as possible can help reduce the intensity and frequency of hot flashes. However, treating the symptom once and for all involves resolving the hormonal imbalance that is the backdrop to hot flashes. Click on the following link to learn more about natural and effective hot flash treatment during perimenopause.